I have been keeping myself from painting any new paintings. 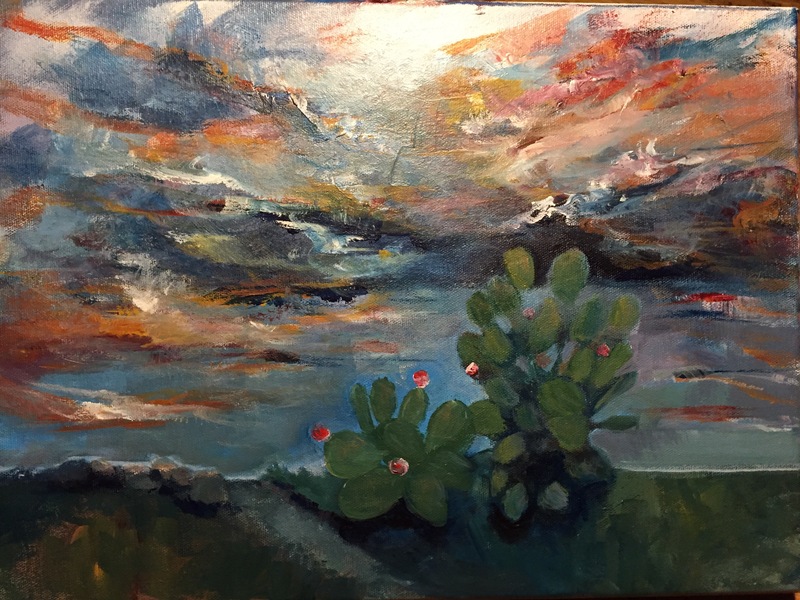 For the past several years in “forced retirement” taking care of my husband who has early onset dementia, I have been on a self quest to learn to paint which has led to a collection of stacks of paintings ranging from beautiful… finished, mostly finished, and ugly as sin acrylic and oil paintings. So, I’ve been taking all of those old paintings and scraping off the old paint and repainting. But, I’ve been missing the hope and possibility in the fresh start to a brand new blank canvas begun painting. I’ve been imagining myself painting on this fresh white canvas this morning. I will, as I always do, study lots of pictures and look around at real life shape and shadows and I will explore the color temperature in everything. And I hope to get right on the canvas what starts appearing in my heart and mind. Over the years I have had the opportunity of time to be able to explore who I am as an artist, and to learn from others, but mostly to learn from the experience of doing it. That makes me excited to start a new painting on a brand new blank white canvas today. I won’t only be painting, but also videotaping it for my new Patreon account to show my creative process. I love the white canvas. 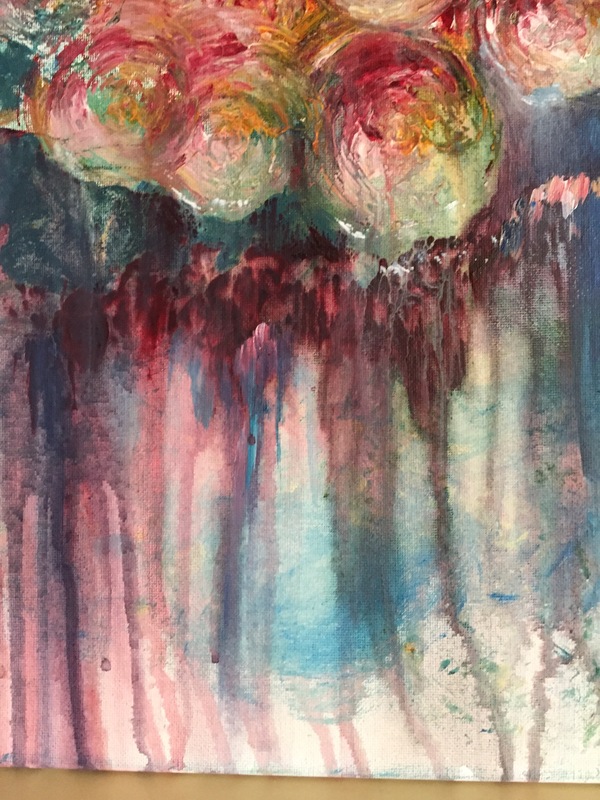 I start imagining how the brush, fully loaded with color, will glide and dobble and scrumble and what the mist of water might do and the accidental blemishes where colors collide that end up being part of the beauty. Many artists begin with painting a “ground” of a yellowish paint all over their canvas. But, I like to begin with the white. and God’s Hill Country of Texas. 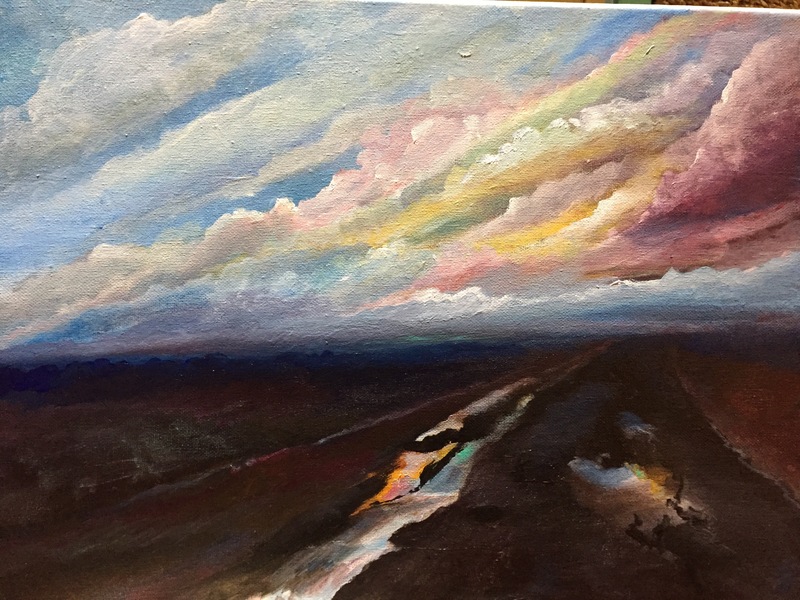 In the scene I am currently painting… the rain clouds just left and the side of the road has become a temporary stream. 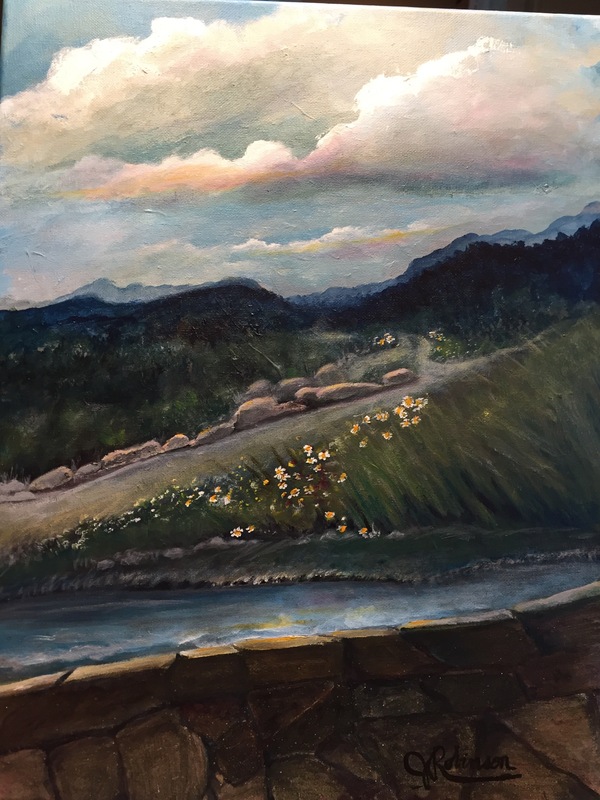 Originally I painted this with grass in the foreground, then I just had to make water appear there which is what happens right now in all of my landscape pathways. I think it is a reminder that though I might be traveling on a seemingly unendingly difficult path, refreshment is provided. 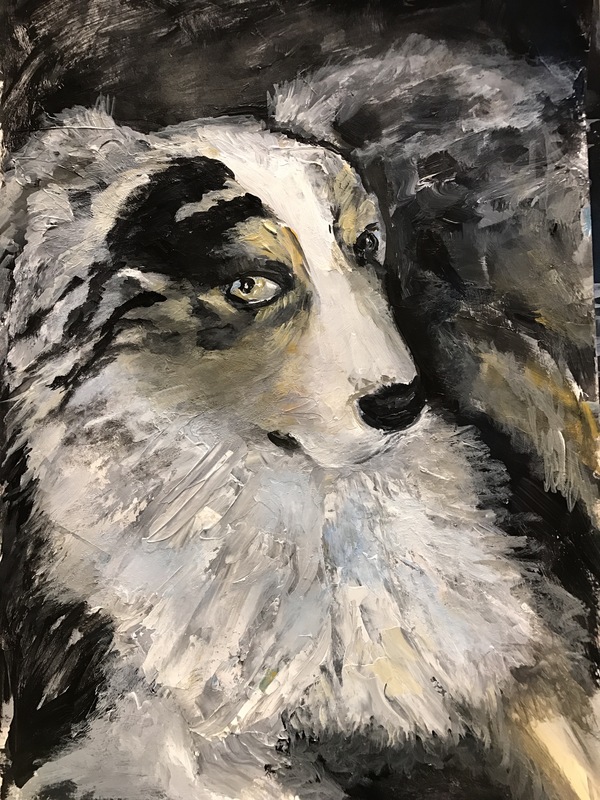 My method is to paint and put aside the painting… I’ve done that for the past several years… it may not be a good method, because that way I have stacks of paintings – mostly finished, some signed, but they are going nowhere. It’s okay, though, I catch myself a little break. 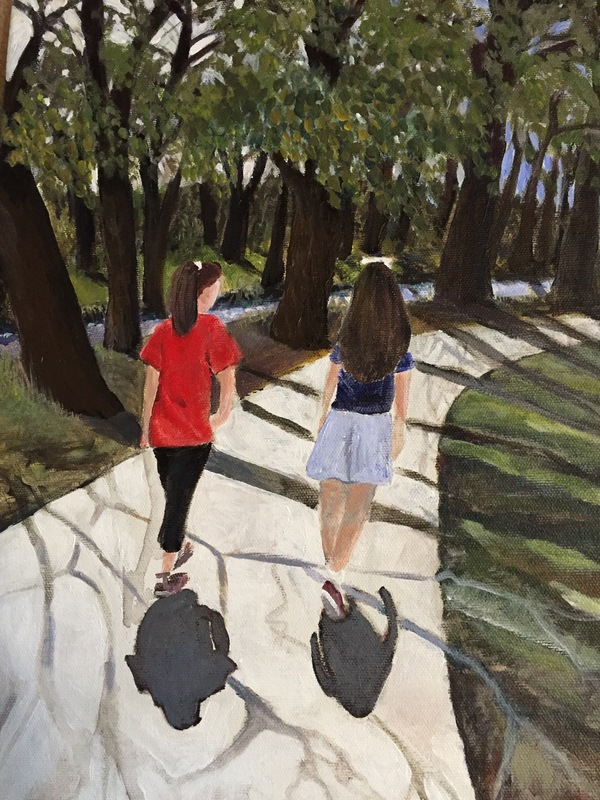 I like this pathway painting, the subject matter was out of my morning thoughts. And, I am happy to put it in the pile of all of the others. We include my husband with board games though he can’t actually play. Since games are supposed to be fun family time, our way of playing does indeed fill that need. He makes up all his own rules and we just let him. We have fits of giggles. 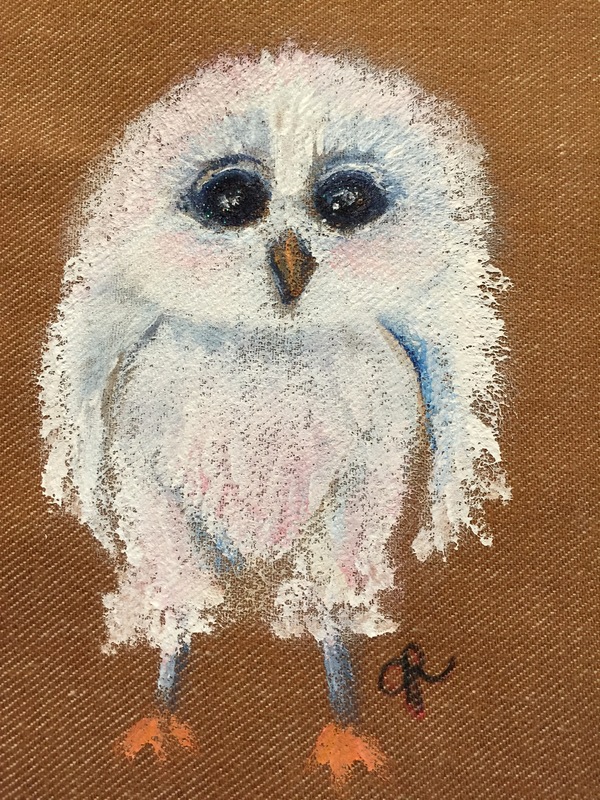 I sold the above clay owl for eight dollars at a local market. 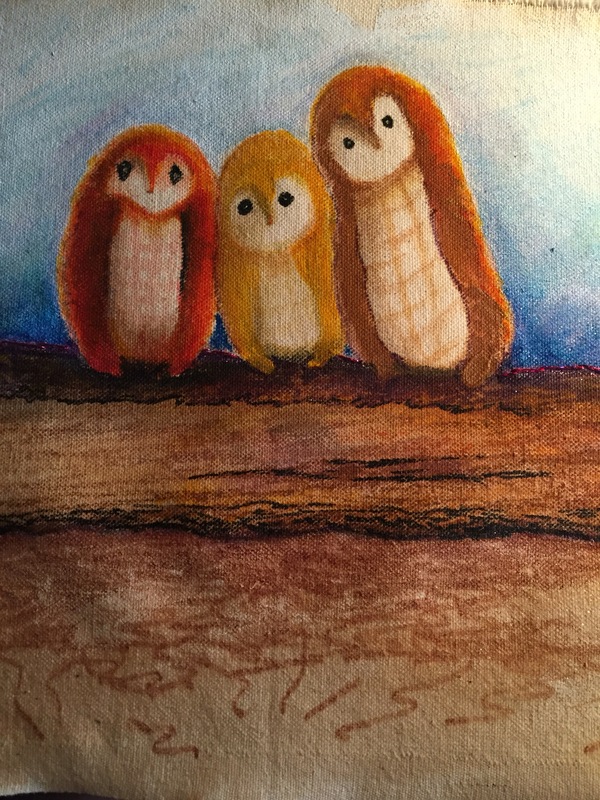 Sometimes I wonder why even bother with the art… how long it took me to form and paint and finish the little guy. But he was a moment of serendipity. We played a game of scrabble where my husband played his words sideways and he didn’t mind that we kept removing his letters so we could play all our high scoring words . We are serious scrabble players and have many hours logged of family time in scrabbledom over the years. I put homemade pumpkin muffins in the oven this morning. Yes, it’s too early for Fall, but to me, after school starts at the end of August, all bets are off. Summer, go away. I have my warm pumpkin muffins and my pumpkin candle from Bath and Body. That makes it Fall here. Never mind that we are still having 96 degree days. My husband asks if he can water the garden though I know he doesn’t really water it. It doesn’t matter, it gives him something to do. And, since I have been a horrible gardener – perhaps consciously killing off the whole entire thing – I let him go out there and give it a go. I think he’s kept the last tomato plant and peppers as well as the Rosemary alive by watering it a little. Mostly he walks around and waters wherever he’s standing in the grass. I peeked out at him from the kitchen window where I was washing the breakfast dishes and I could hear the loud sound of the water on full blast. He had the spray up at the highest up over the fence, watering the live oak tree in the field behind our house. The pumpkin muffins were good, warm and gooey just out of the oven. 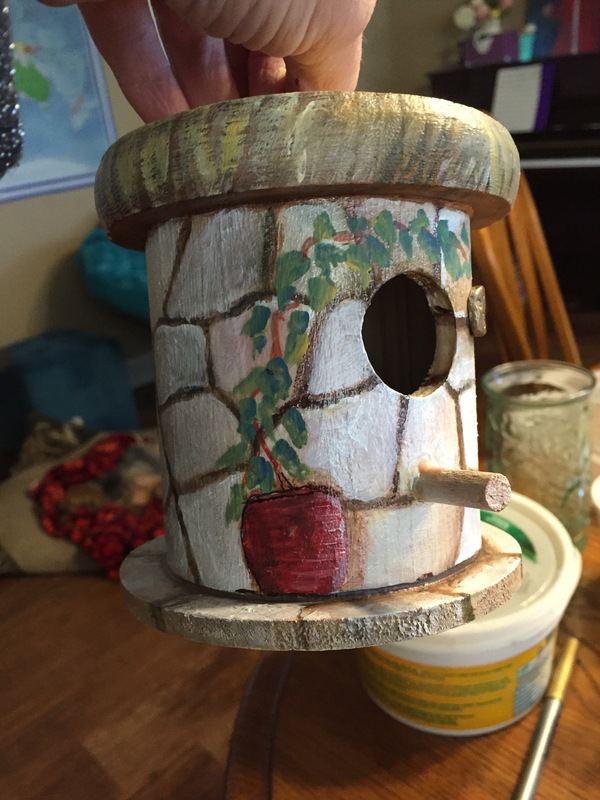 Caregiving Vignettes: “How long, Dementia? Isn’t it what anyone wants to know who has been stricken with a debilitating disease? One with no hope for a cure? One with no drugs that actually work? I use the word “stricken”, not to overstate, and not to overdramatize. The actual meaning is to be seriously affected by an undesirable condition or unpleasant feeling. I think we were all stricken by my husband’s dementia. His neurologist could not answer the question. “There’s no way to tell, actually, because it is different for each person.” I could tell she liked neither the question nor giving the answer. I felt bad for asking. Well there are what’s called “stages”. Some experts use the three stages to describe a demented patient – basically giving the illness a beginning, middle, and an end. Then there is the seven stage model with what to expect at each and about how long each stage lasts. But, with the caveat that the person might exhibit them in a different order or a different timeframe. I won’t list those different stage models. But you can take a quick google on the matter. It’s super easy to find. I am no scientist but I can observe and compare like a scientist. Surely, I can observe and compare like an artist. Possibly there is an answer to that difficult question. Everyone caring for a person with dementia has a story to tell and if we talk about what we are going through, like I am here, perhaps there are some comparisons to be drawn and some answers. My husband first showed symptoms (though I didn’t know what it was!) of bvFTD (behavioral variant frontotemporal dementia in his late 50’s. He’s now nearly 71. I will tell, in very very short, the very beginning of his story and then in other blog posts I will add to it because it is just way too much information. My husband was the senior partner in his law firm. He began slowly having a change in his personality. No memory problems. No other problems. He just was not the same person anymore. He was making uncharacteristic decisions. Only I noticed it, but then, I am his wife. But, it was nearly a decade from when I first began to notice the few subtle changes before his actual diagnosis of bvFTD. Why? Why do I want to share this? It’s because this very personal information that I have held so closely for so long is exactly what I was searching for. The answer is, it’s in the story. We are still living it, so I will tell it as it goes. 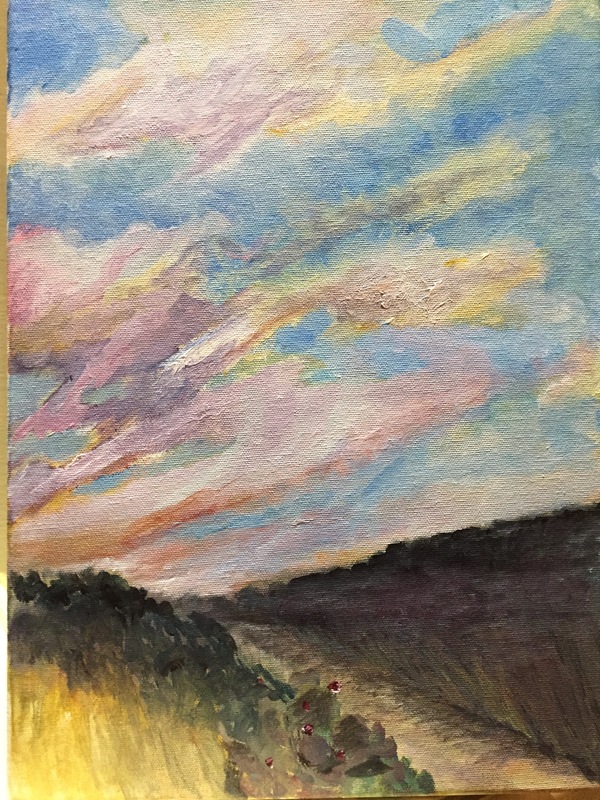 The above painting is in my pathways collection where I explore visually the idea of continuing by faith on a path. Here I imagine that this person has been driving for some time and it’s the end of the day when the golden hour of sunlight spills into the scene as it does each evening at the golden hour, filling all it touches. Sometimes the road is weary. What do you do when you are a passenger in a car and feel motion sickness? The road winds and you do too. When I was about seven I packed my colorbook and crayons for a cross country road trip, imagining coloring up an entire book, but I probably made it through one page when I learned the definition of “carsick”. If I think about it now I can remember the smell of crayola mixed with stationwagon seat vinyl and then the smell of melted crayons because I put them on top of my suitcase in the sunshine. For years after I had a red Samsonite hard-sided suitcase with lovely melted crayons imprinted. After I already feel that initial quease set in there is no relief possible by looking forward at the horizon which is the suggested fix. There’s nothing better than being able to get out of the car. Nothing stops the feeling of great unease after it has begun welling. Nothing but the car stopping. I’d try with my seven year old self to look so hard up ahead and keep my gaze fixed but it just didn’t work for me. Taking breaks along the way helps and it helps for the road of caregiving dementia. They call a caregiver break “respite care” in caregiver lingo. A quick dictionary search defines respite as a short period of rest or relief from something difficult or unpleasant. We have a place in our town that that gives respite. It’s called “The Take 5 Club” where I take my husband three times a week giving me a five hour break. It is $35.00 per day. The alternative is to have a home care service which is $20 an hour with a for a four hour minimum. What I like about the home caregiver is they clean while they are here. But it’s $80.00 and I feel forced out of the house. And, sometimes I just want to be at home without him here. I am needing a longer respite and am checking into that now. My next post will be the results of my research. 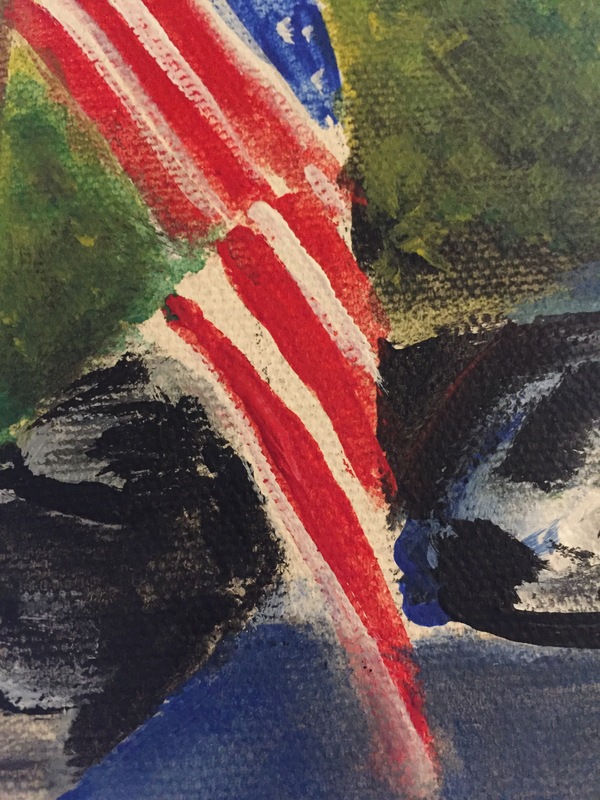 The painting above is one in a series where I was exploring artistically the idea of paths, and in each painting I was reflecting on the two paths in Matthew 7 that Jesus describes. 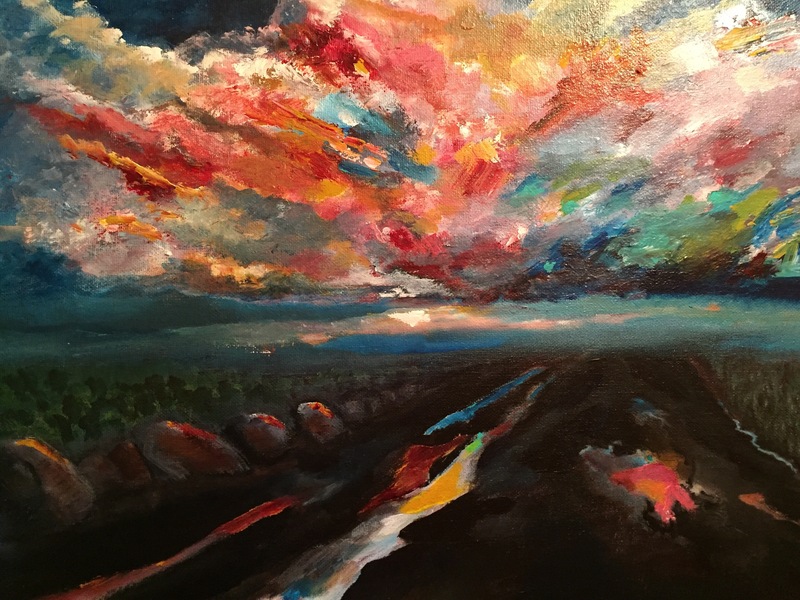 I like to paint a path that goes around a bend and you have no idea how difficult that path may be but there is a glimpse of color in the sky if you look up. 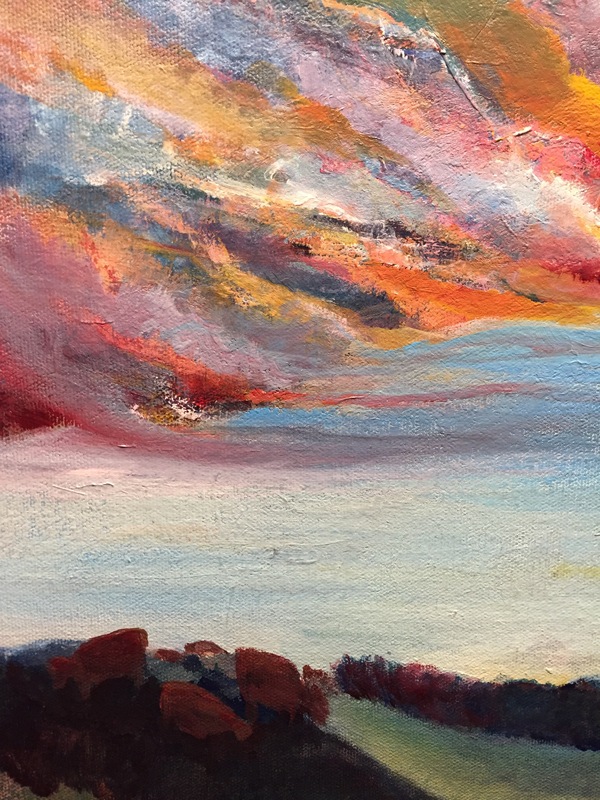 A sunset usually appears in my paintings even if I start out with a nice blue sky with perfect fluffy clouds. Invariably, I paint over it. 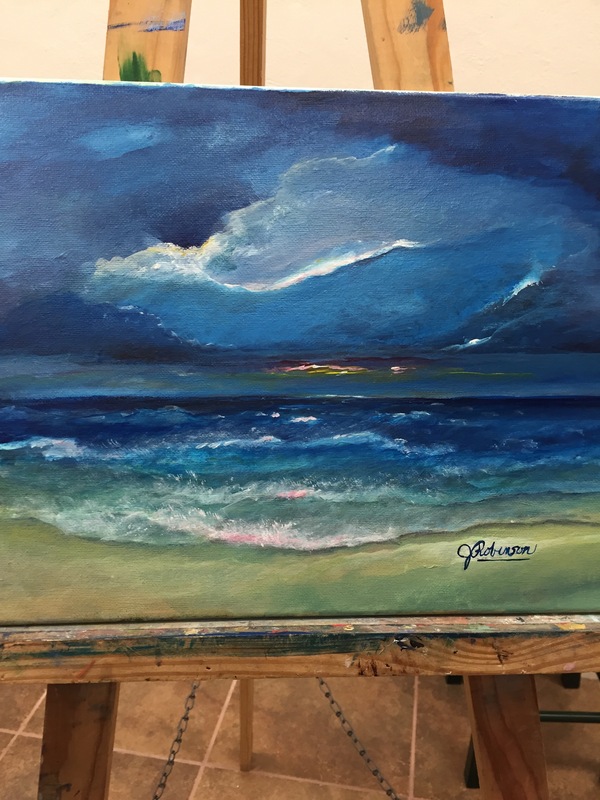 I do the same with placid ocean scenes as find myself painting, in the end, a stormy scene with crashing waves against rocks. Drama. But it does seem peaceful and cathartic to me for some reason. 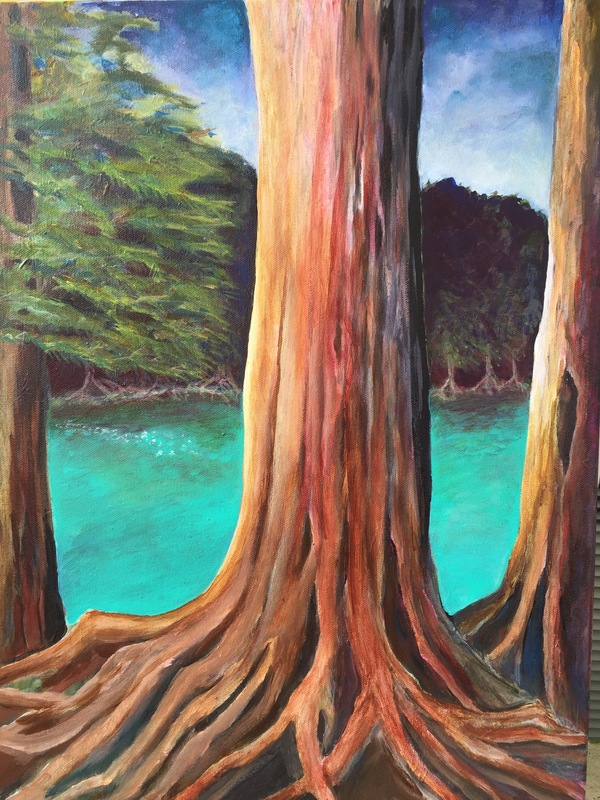 Sometimes when I paint, I imagine myself there in the painting, looking around, experiencing it. Weird, or funny? 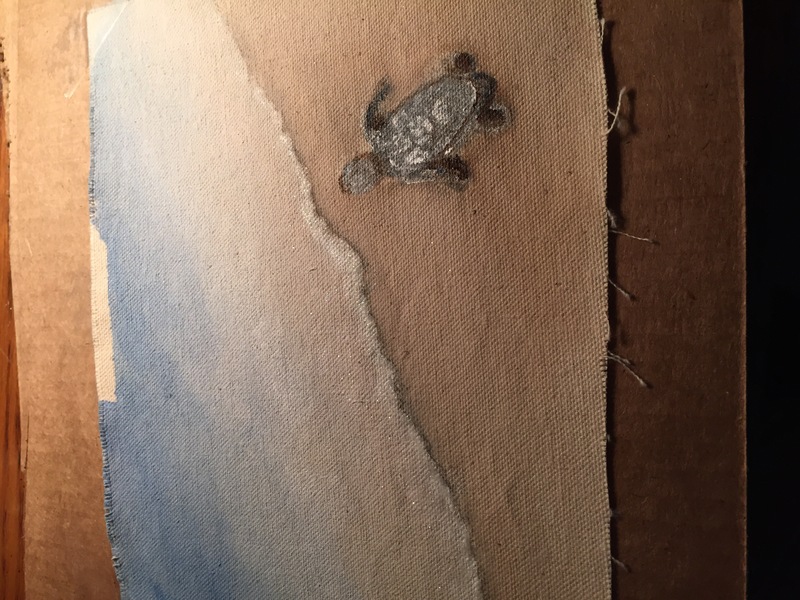 Once I wrote a child’s book and sent to my grandson of how I climbed into a path scene painting and at the end of the path I could see the ocean where I picked up a shell off the beach and brought it back to show him. So I gave him the book with some shells to make it seem like the story might be real. I feel that being a caregiver is like being on that rocky and dimly lit path that has a beautiful colorful hopeful sky so I look up and keep my faith and hope for a beautiful beach. My mother has taught me to first simplify, then refine. This works in every area of life. I sometimes get lost in the details and it keeps me from getting the job done. (1) things that go in the garage. I’m guilty of putting all kinds of things in the kitchen junk drawer because I don’t feel like going into the garage to put things away. (4) things to throw out. Isn’t it true that junk drawers basically are filled with those things? Don’t think I’m a neat freak, just a semi-reformed messie. In the workplace, for those who still file actual paper… If you are filing a stack of papers into a filing cabinet, first sort them alphabetically then when you go to file you file quickly. Simplify, then refine. I use this principle when folding towels. First I separate hand towels, face rags, and bath towels. Then the folding goes quickly. Another example is groceries: first put them all out on the table or counter in groups, pantry, spices, refrigerator, other, then put them away. If you got a good bagger at the grocery store that helps. It’s a good thing I got a little better at simplifying and refining because add a husband with dementia to a wife who’s a messie and you get disaster. Since my husband cannot put his things away, his room gets messy with interesting things he puts in his drawers, food, dirty clothes, books, trash. I said before in a previous post that I made him a minimalist. Now, I am not at all a minimalist. I like my cozy cottage feel that is a little arty/cluttered. But his room is different. He gets confused about his clothes. He never can find his electric razor though I keep it plugged into the bathroom socket. He keeps putting it in funny places. His closet, which is a very large walk in closet that I used for storage of many different things, now has been very minimalized. He has only a few pair of khaki pants, a few shirts and T-shirts, and on the wall I have a shoe holder where I slide in his underwear and socks. That way everything has, at a quick glance, a visual place. That actually helps me because now I need to help him more than ever. He at one time was able to find his clothes to change into. But now we have to go in and get his clothes out for him. And, if I do not stand outside of his door and say, “Ok, now, take off your shirt and hand it to me”, and when he does, I hand him a new shirt, he will just put his same shirt back on after his shower. Same with all his other clothes. This is our method to keep him from wearing the same dirty clothes every day. If I don’t do this he will sleep in them every night. Being simplified and refined helps dementia care. Thanks, mom. Mom’s always right. There is a pattern of behavior I have noticed in my husband where it comes to his temperament change. I call this “escalations” from his usual difficult behaviors such as looking to eat every ten minutes or talking about walking out. My usual way is to redirect him. And usually it works. But when he escalates it’s very difficult to impossible for me to get him redirected. I think redirecting might need to be defined here. How I redirect is to change the subject with a smile and talk about something else. I even will suggest that going out may be a good idea for later but that he really needs a shower first. Or I get us some water bottles and suggest he sit with me at the kitchen table. Or, lastly, I will give him a job which helps but isn’t always helpful such as with the incident of the bag of trash. Often in our marriage he would be the one to be in charge of trash and until recently he would see me carrying a bag of trash and he would take it from me out to the large bin outside. But he couldn’t any longer find the outside trash bin and so he put it in my car. And it sat in the hot car in the garage for a couple of days. It smelled like a dumpster. The list is short of the things I now suggest he do. On the escalations, Sometimes he is impossible. Recently I had to call the police to come because he walked out the door and I had to pick him up in the car and bring him home and all the while he was still in the escalated state saying he was here now but that he would be leaving. There is absolutely no reasoning with him which was what the very nice police officer tried to do. It happened to be over a hundred degrees that day so she tried to reason that point. I didn’t school her on this but there is no reasoning with him. He was beginning to escalate tonight and so I just simply asked him if he wouldn’t mind going to his room and so he did. And he fell asleep. 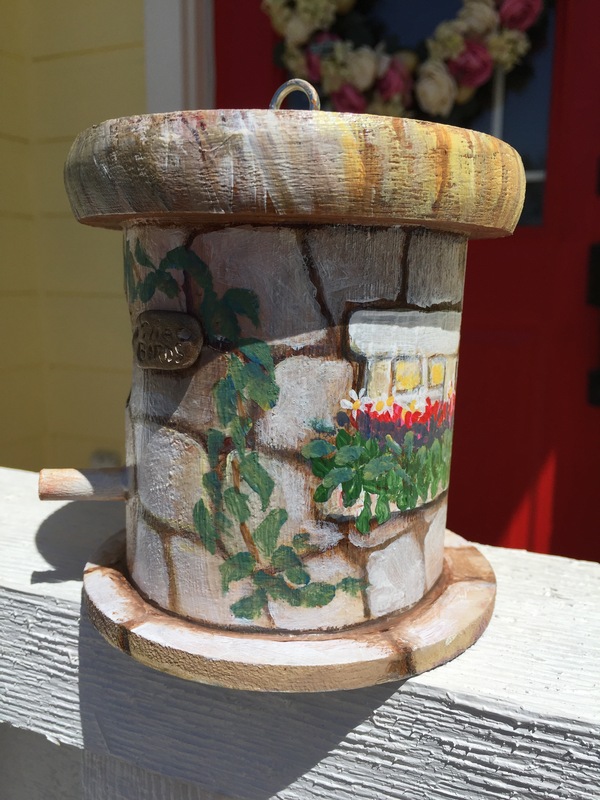 I am using Lavendar spike oil and I leave my art room smelling like it. But I love the workability of the paint long after you initially lay it down. 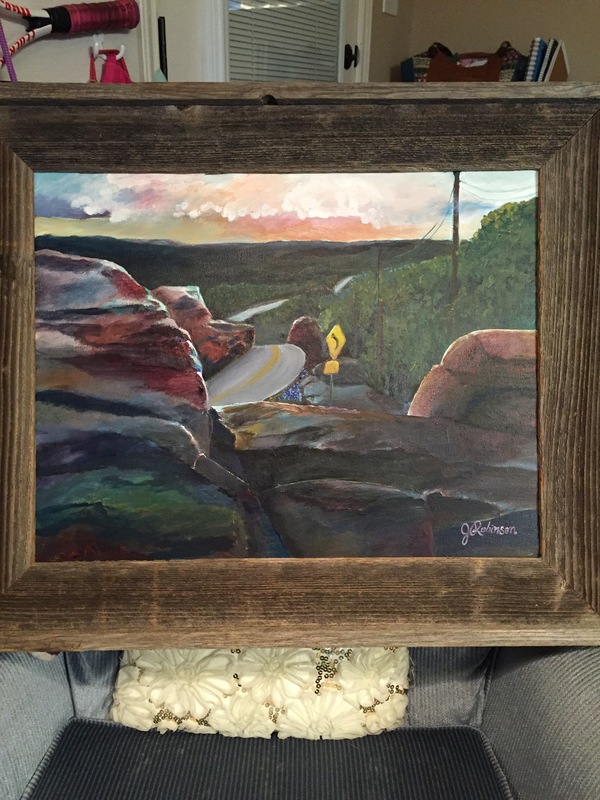 I was commissioned (by my mother… does that count?) 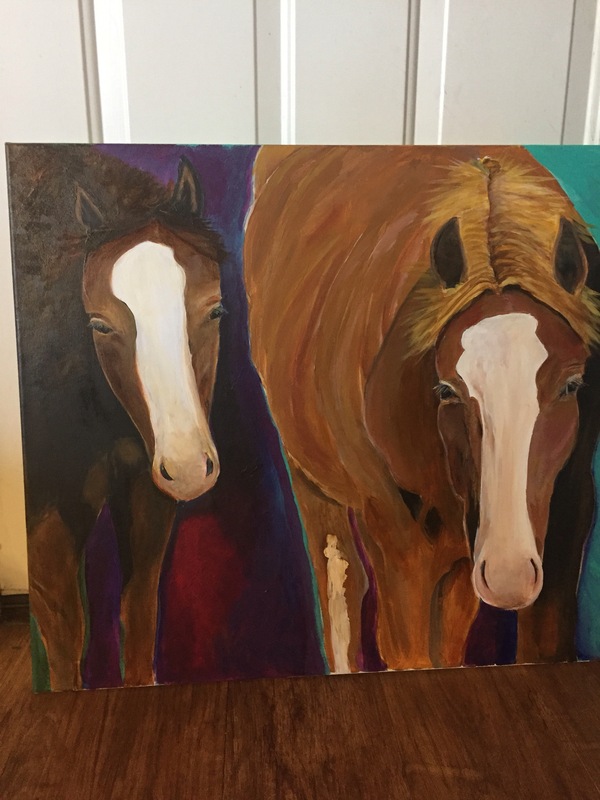 to paint for my brother and sister-in-law for a Christmas present. 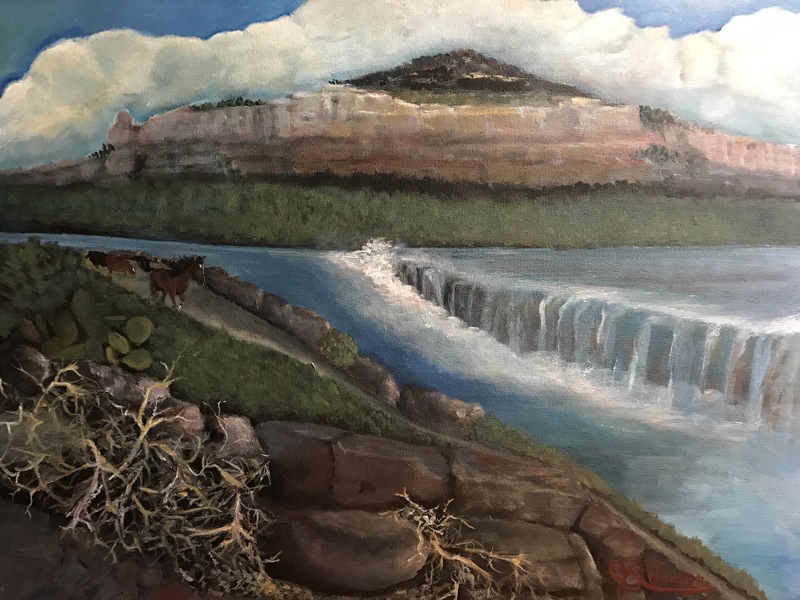 I took a picture they had sent of a mountain in their backyard and added things to it so technically they don’t have a river back there but all I had to do was paint one in. My brother’s dog’s name is Nick. I was recently texting back and forth with him and bantering about life and he sent me a picture of his dog who was giving him the what he calls “stink eye”. I impulsively though I haven’t done dogs before with paint, decided I had to paint him. With his white “beard” he looks a little bit like Saint Nick in dog kingdom. I like this sky better. I got up this morning and couldn’t stand looking at the other sky. See yesterday’s post. Here is the change. The layout and feel works better I think. I love practicing applying paint using varied methods of stroking. For some of the strokes I turned the canvas upside down. I have smart artist friends who have art degrees and they say to look at your painting in the mirror or look at it upside down. I think it helps you see things differently. When I righted it I was amazed at the difference in feel it gave. Thank you Artists in Action. Caroline. She’s not big turn it upside down brilliant artist. I spent two days painting the sky different ways. And yesterday afternoon there was a deer but then it just did not make sense in the composition so he is buried under. It’s a wonder and canvas texture is left. That’s why I love acrylic paint. It layers on up. I think a color burst happened to this painting where I was thickly gobbing on the paint. Is gobbing not a correct verb? Spell check tried to change it to gobbling. Then it wanted to capitalize it. But pressing on I forced the gobbing because I wasn’t gobbling it like people with strange addictions. I watch YouTube as I treadmill and love to watch artists gob. There you go. Some do gob and say we of course should too if we are acrylic painting. Because it makes it dimensional. 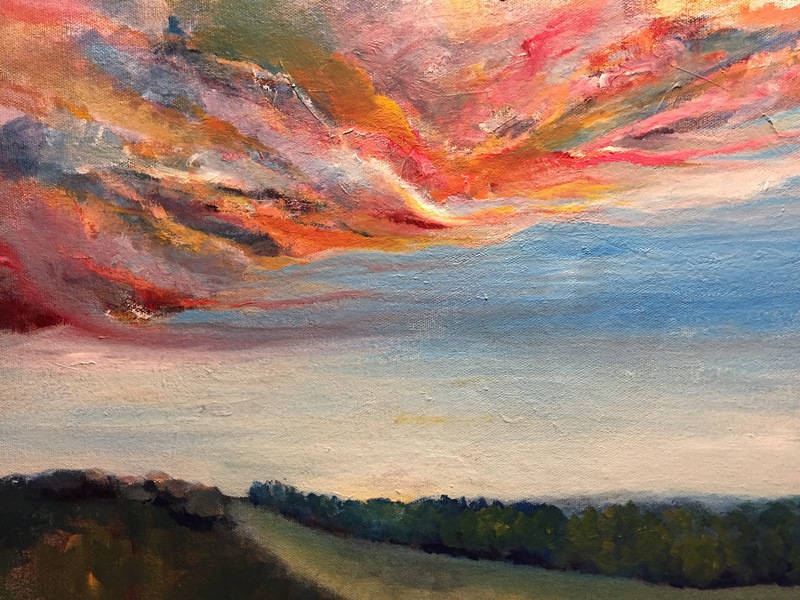 I was walking along at 2.5 mph which is about what I do usually and considering all my many paintings I didn’t know I was supposed to have gobbed on the paint. I always have a love/hate relationship with my paintings. I’m looking at those rocks knowing I need to do something about them. Add more irregular sizes? Paint over them? I love my sky. I am a sky lover anyhow and feel that my photos never pick up the colors brilliantly. iPhone camera I’m sure must have a setting I should learn about. Or better yet paint the sky. That’s what I’m doing. 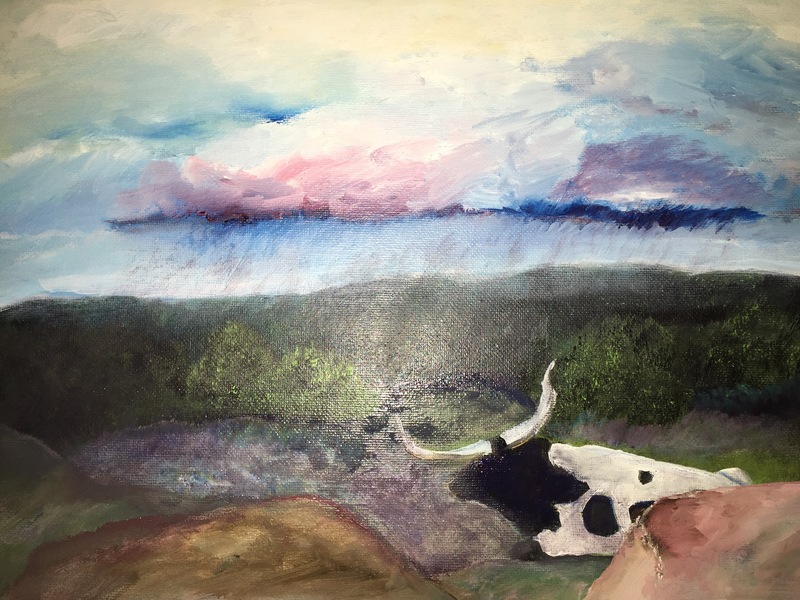 I’ve been doing a whole lot of landscape painting. 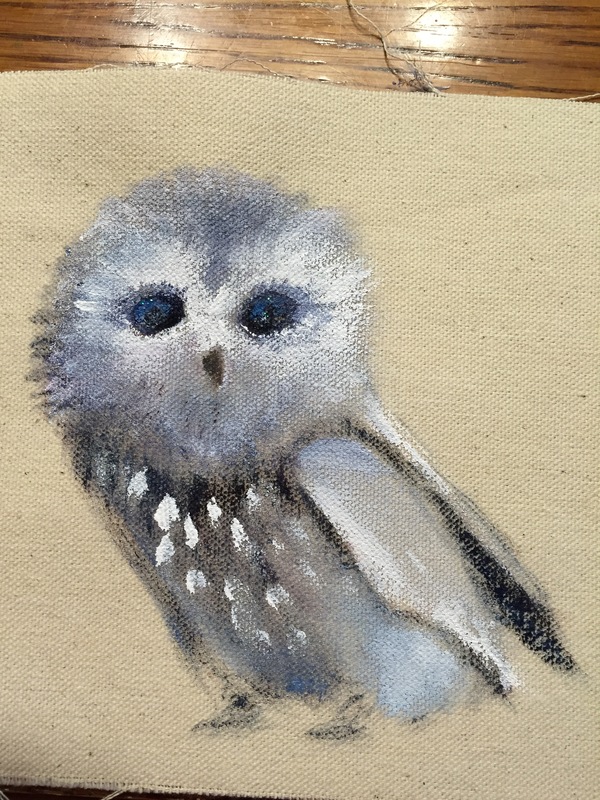 I am enjoying trying some techniques where I loosely paint and use a reference photo but mostly develop the painting as it develops itself. 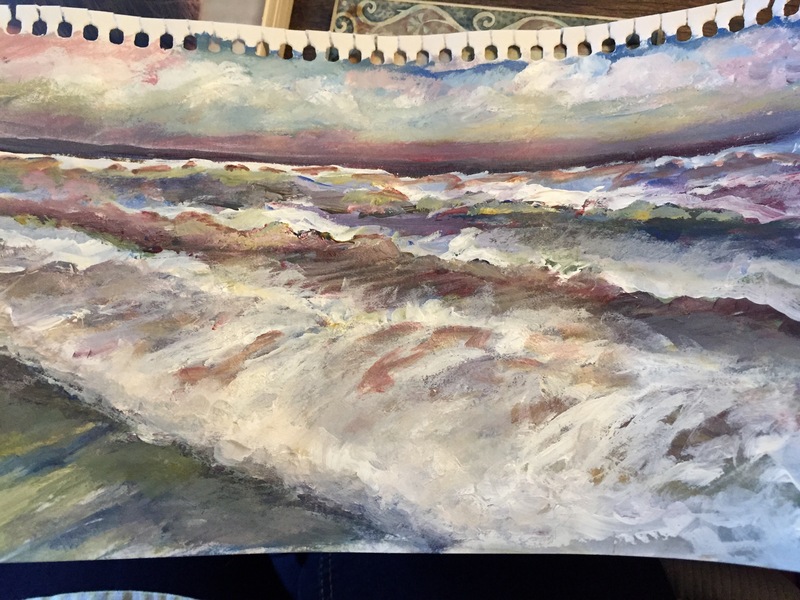 This ocean scene is done on paper as a sketch for a bigger canvas. Ignore I said previously that I was sorry I did the ocean scenes and was thinking of painting over them. What was I thinking? I love the ocean and wish I could go there. 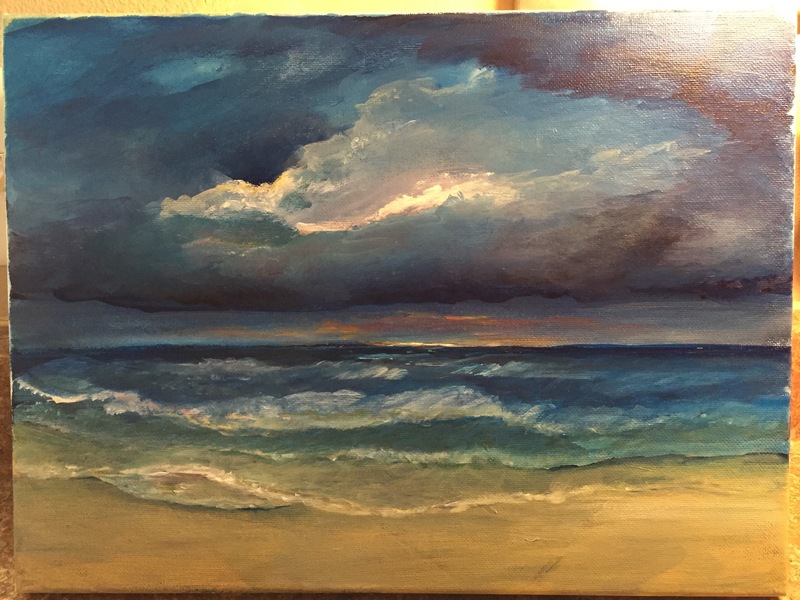 I am interested in learning how the waves work and how to translate its power to my art. I really like red but not just any red. Vibrant red. I think I must feel red emotionally. In the fall I remember candy red apples we used to almost lose a filling eating. Ever see those anymore? I love the color of red candy apples. And red cars. Yum on both. Red, while deeply attractive, can be overkill. The red sports car you buy during a midlife crisis or the red room you hate in the middle of painting it. If you know about paint you will know that overkill… Kilz. 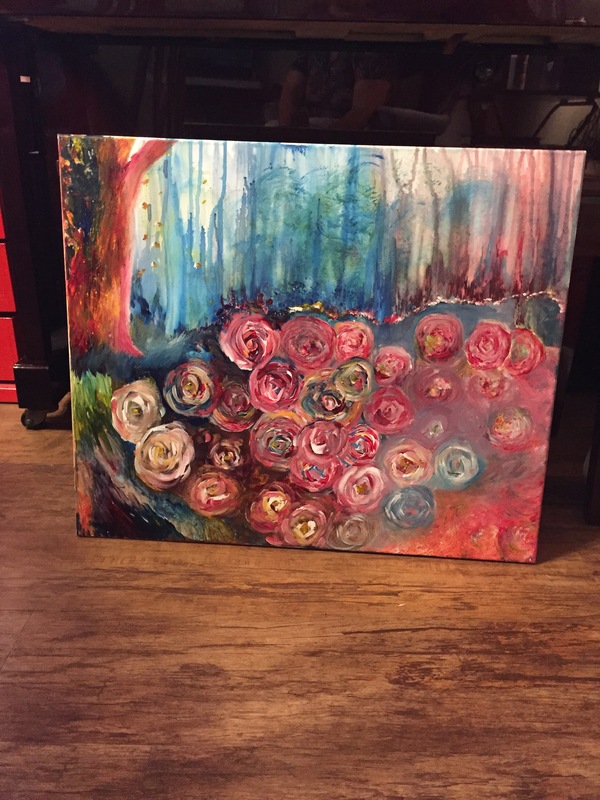 I have found that in painting, red brilliantly pairs with all kinds of color. I try to think of any color red looks bad with. And it sings next to blue. Cue the flag. I think red’s vibrancy touches the heart. All that about red and I prepped a canvas with shades of dark blue. I’m not sure yet what it’s going to be. Maybe a red rose or a red camaro at night. 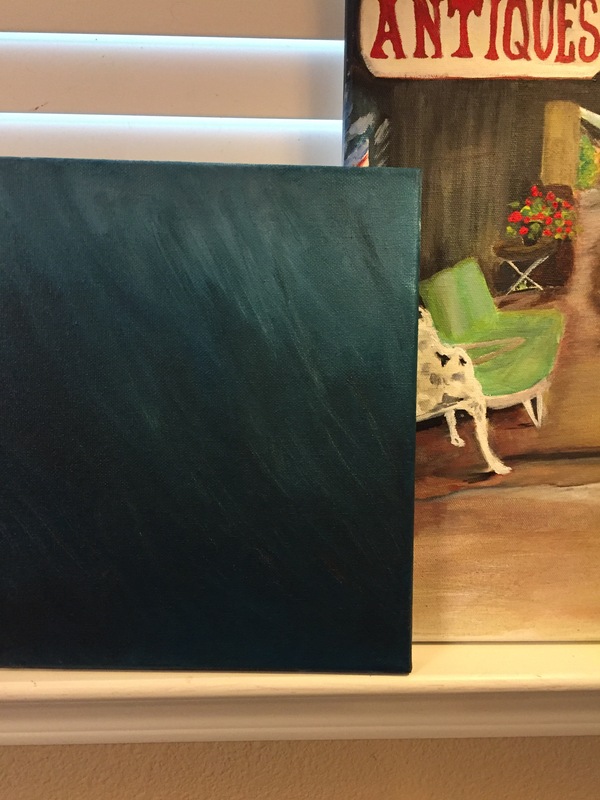 Here is my blued canvas next to my “Antiques” painting for color. In see grass in those blue streaks. I love antiquing with my mom. She tells stories of how they had this thing or that and what times used to be like. I wonder if much of today’s stuff will survive long enough to land itself in an antique shop. I’m not fooled anymore by the shine and cute packaging when the product doesn’t last. I think the shop those land in is the landfill. Like the veggie peeler that couldn’t hold itself up to make it through one potato. And who do you contact to get your money back. Probably nobody cause you spent $7.99 for it and is it even worth the effort. A special word to Ellen, Thank you for looking at my blog and saying that you like my writing because I was wondering if it was too much. Thanks! Anyhow back to antiques. 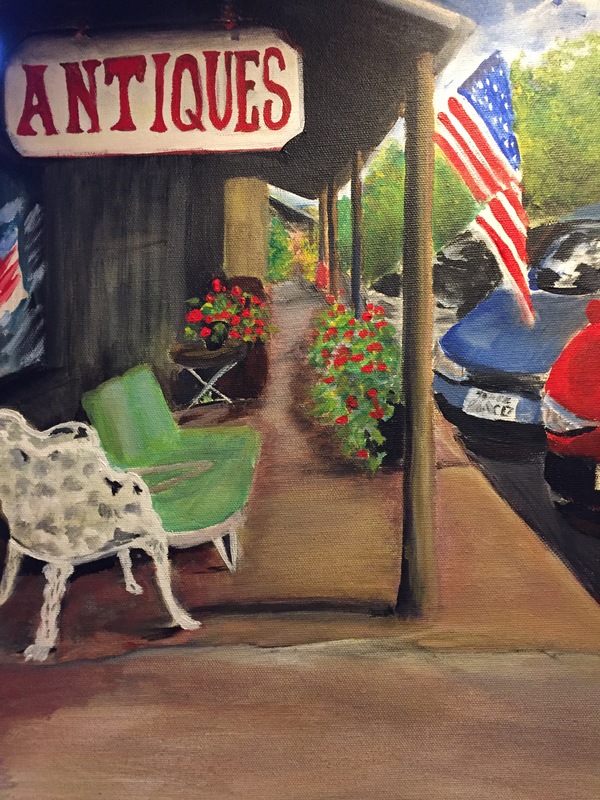 Comfort, Texas is a favorite place to antique and have a little lunch. 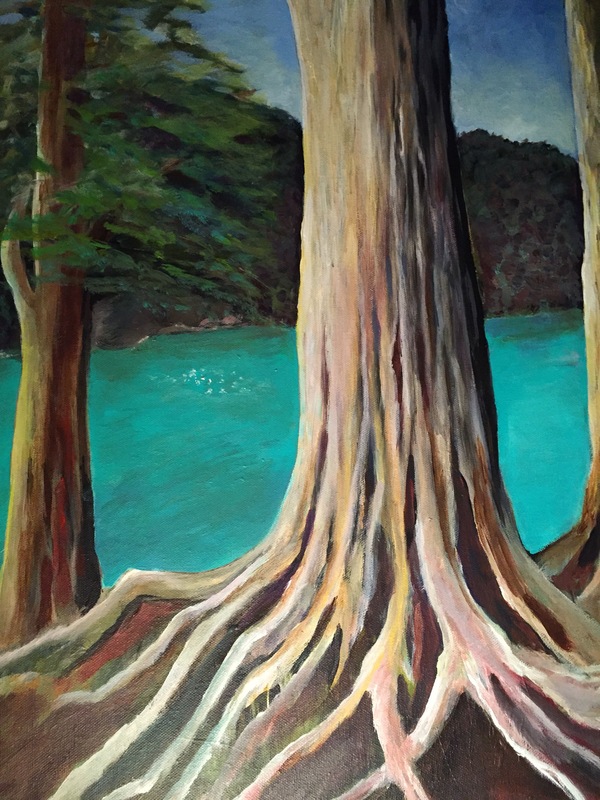 My painting painting is from a photo I took there last summer. I took liberties when painting it and that is the freedom I feel as a painter when orchestrating colors and shapes to appeal to the eye. 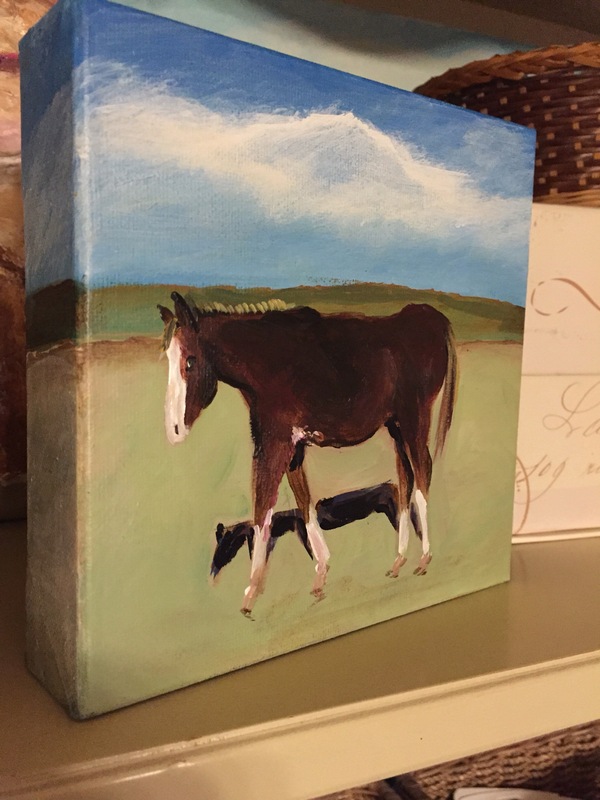 I painted around the canvas sides so this one won’t need a frame. 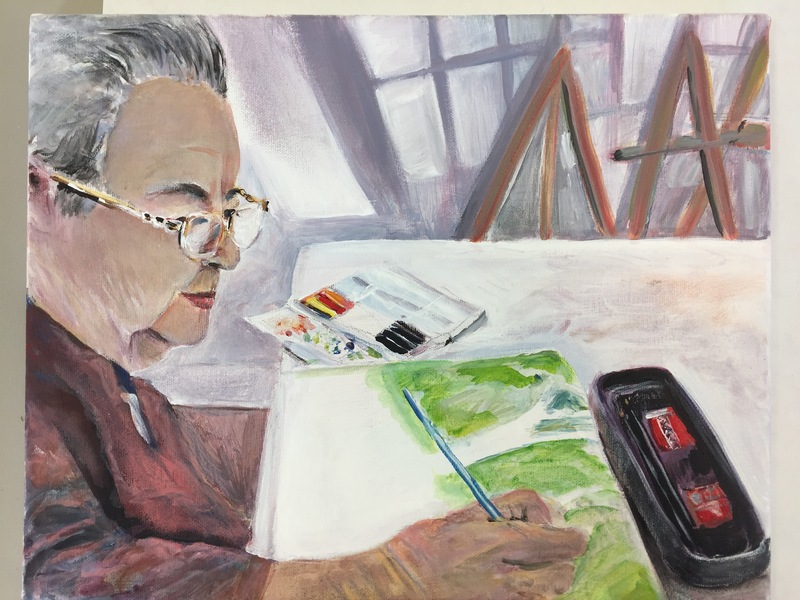 When I arrived to my art group last week… called “Artists in Action”, I was as I so often am… between the problem of “what to paint” and my continual desire to learn something new. 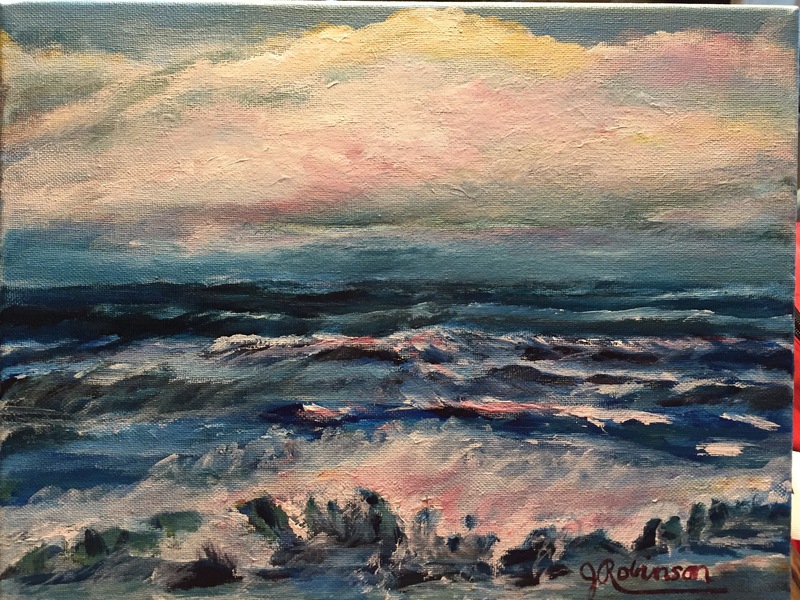 I had done so many ocean scenes and quite simply haven’t really liked any of them. If you scroll down through my blog you will see them. I most likely will be painting over all of them and reusing the canvases. I won’t delete the blog posts but I feel like I should. But not really because I am blogging to document my progression as an artist. 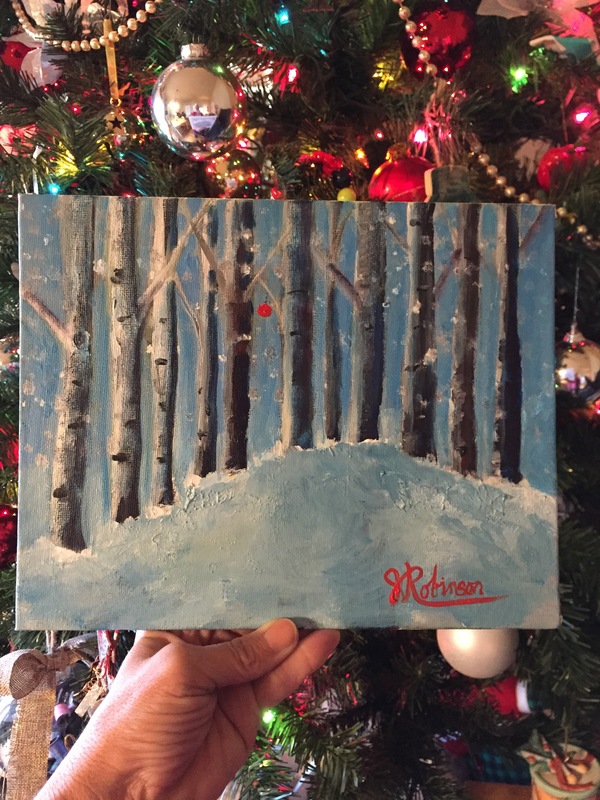 Just about a year ago I joined the Artists in Action who paint together each week. I joined feeling intimidated because all of them have varying art degrees and years of experience. I jumped in and they have been so encouraging. So this is Judy. She sits across from me. 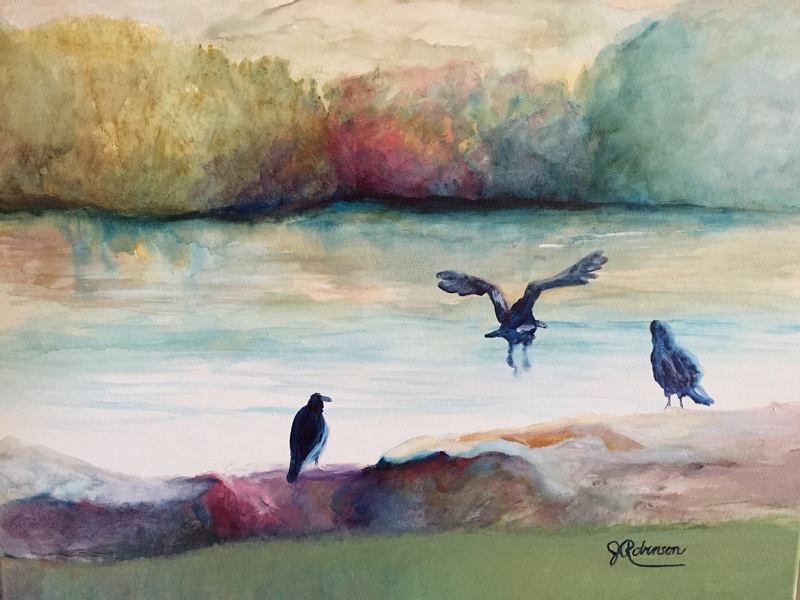 She is a watercolorist who works from her many sketchbooks filled with studies of people deer trees and whatever else lands in the park where she sits and sketches as her husband takes his daily walks. This is her beginning a watercolor painting as the artists are all still arriving and bustling with their exciting lives. The room was filled with light and the huge windows made the back wall a puzzle of shapes along with the wood easels. 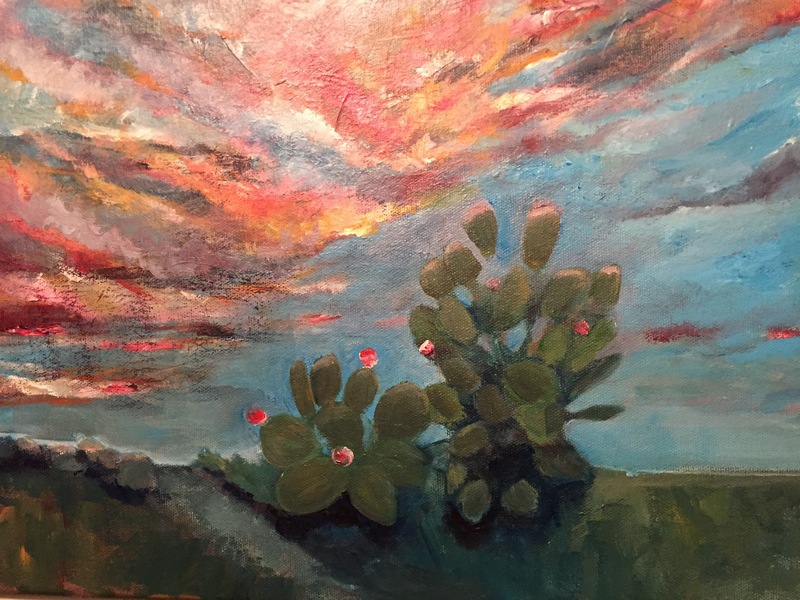 Some life events took center stage for me recently which kept me from painting. 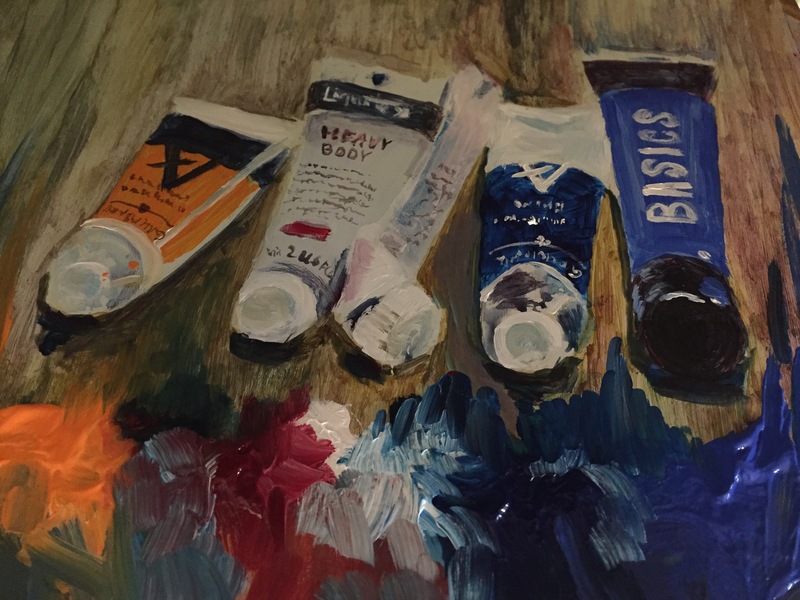 This painting of my paints is my path back in. Why did I paint my paints. Possibly because I laid them out and stared at them awhile thinking what should I paint. I looked through some art magazines and some photos of mine but was inspired by the paints. I do love the colors and the way these colors mix. I just recently bought the cadmium orange and am excited to do a real painting with it on canvas. This is a board. I don’t really enjoy painting on a board but it was there and so I was doing kinda a non painting … uh … painting I thought the board would would be fine. At the end I decided to squeeze and smear the paint colors in front of their painted tubes. I think it’s art in action. Speaking of which I miss my art group I can’t attend presently. I came to my art club this morning and everyone just loved this painting it made me so happy. 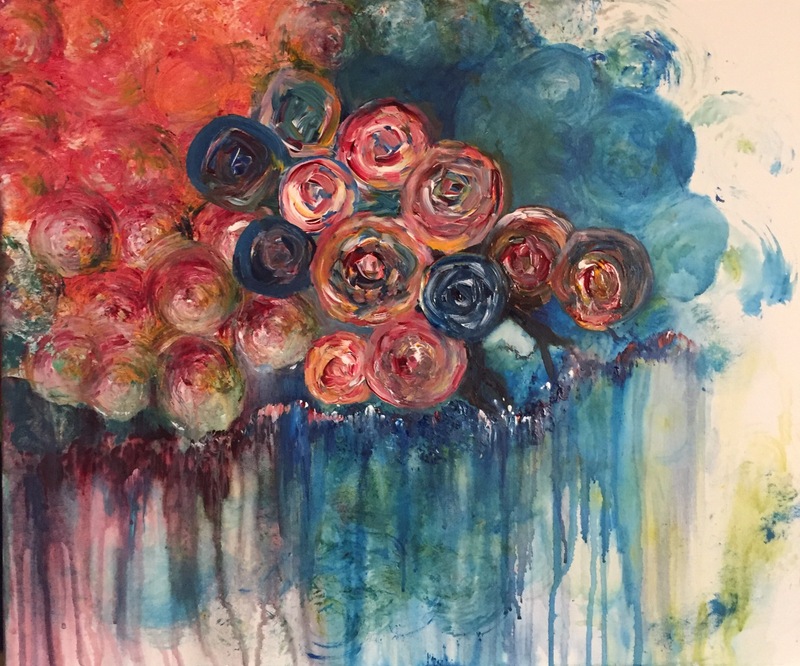 I previously posted this roses painting that I had spray dripped. I turned it upside down and there was a forest as if it had just burned. 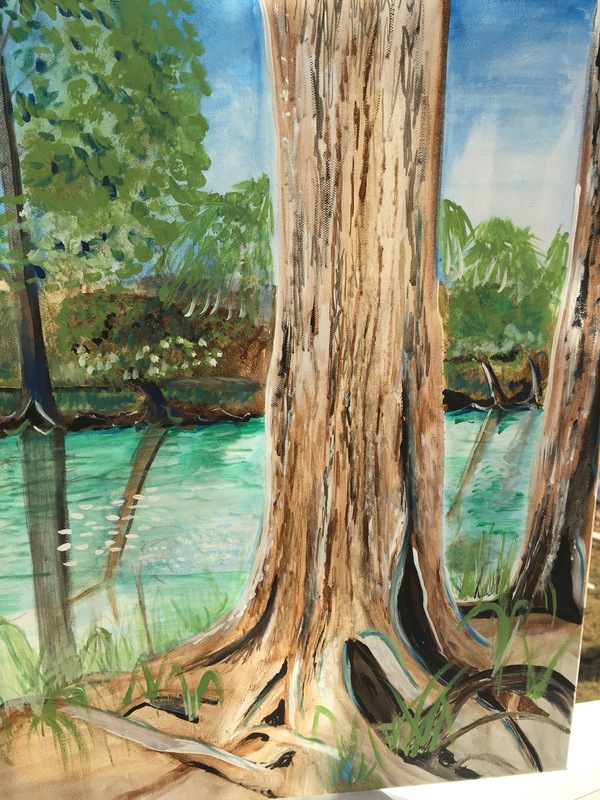 So I painted in a tree. 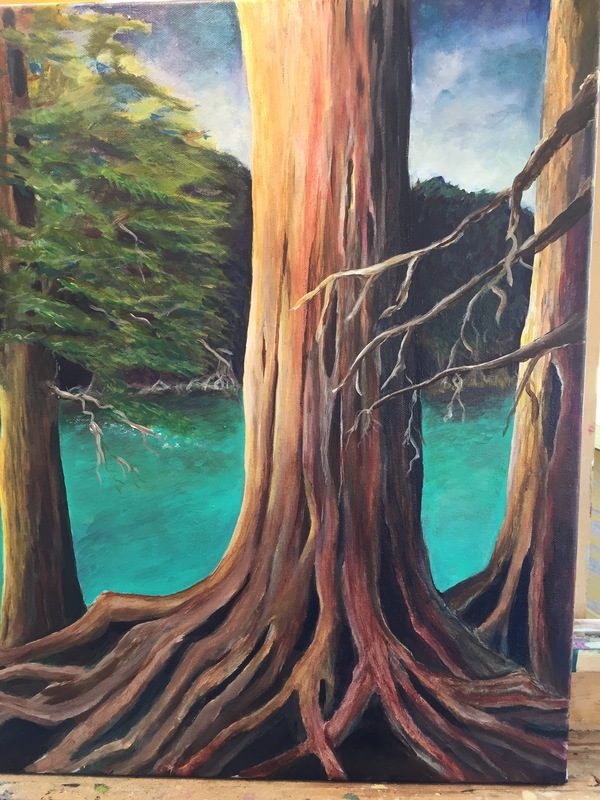 After tutorials I watched in YouTube I warmed up colors in my middle tree and added a branch to bring together the painting. 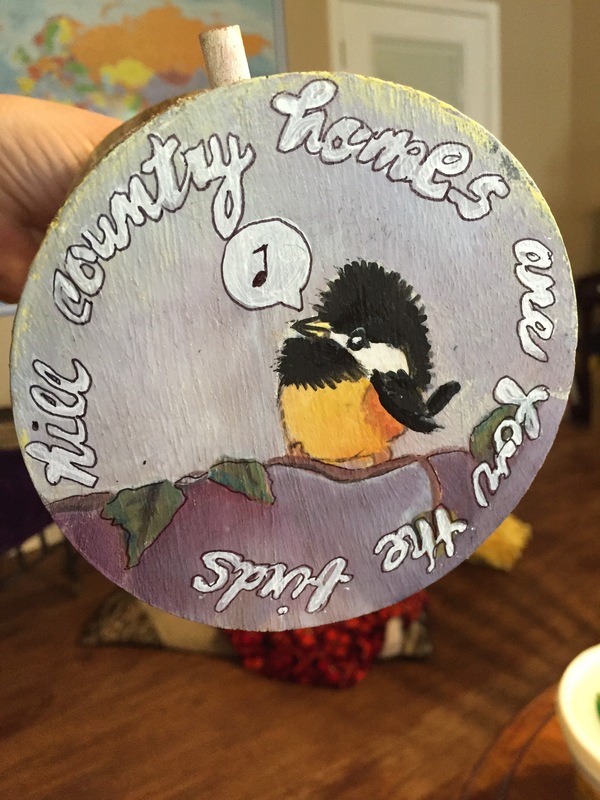 Hill country rocks this little bird’s cottage. 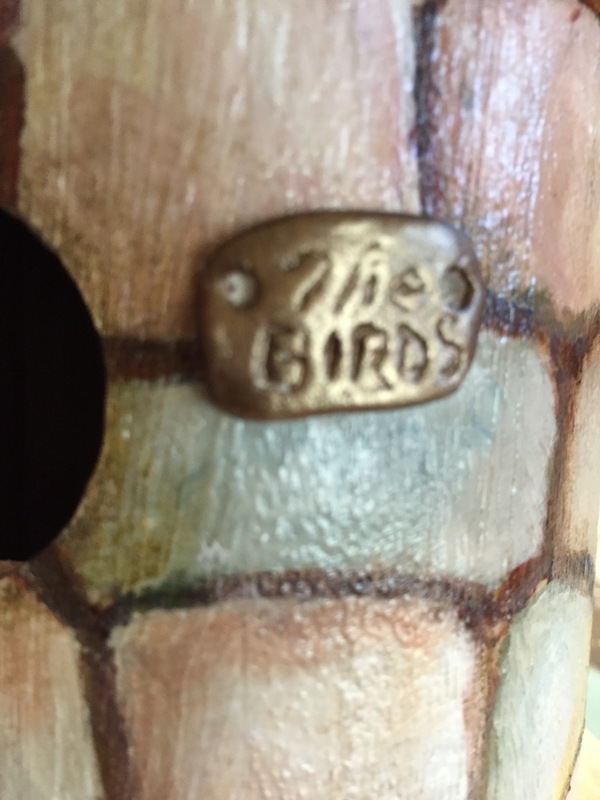 The plaque “The Birds” is air dry clay. 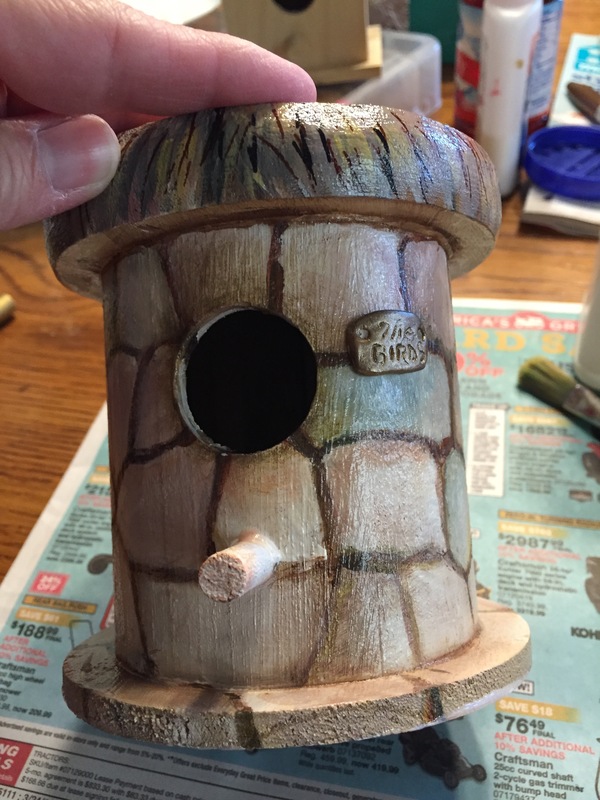 Was considering making a clay bird peeking out of the hole. These will be placed for sale in the KACC store. Other artists are joining in too and I will be excited to see what everyone else is doing. 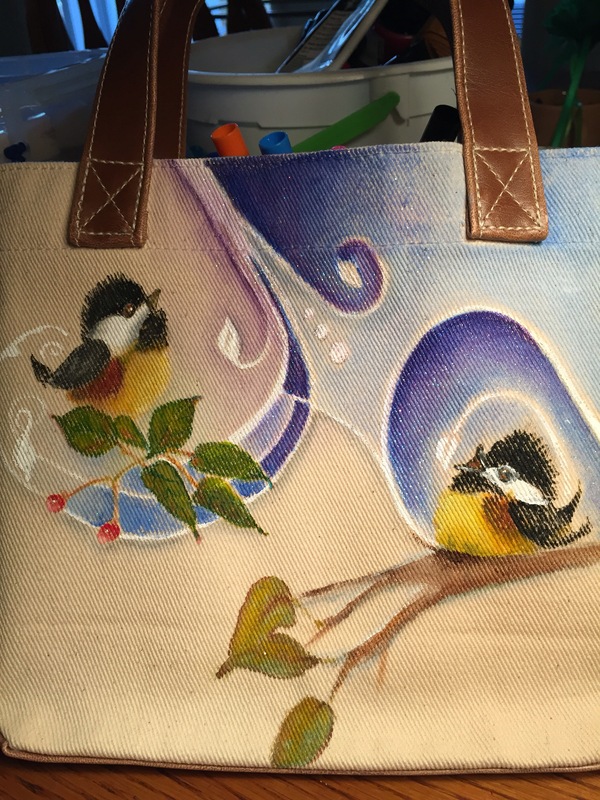 A member of my art group is moving and we all are painting on this apron as a gift for her. I bought the apron and started it off and will take it there tomorrow for the others to add. 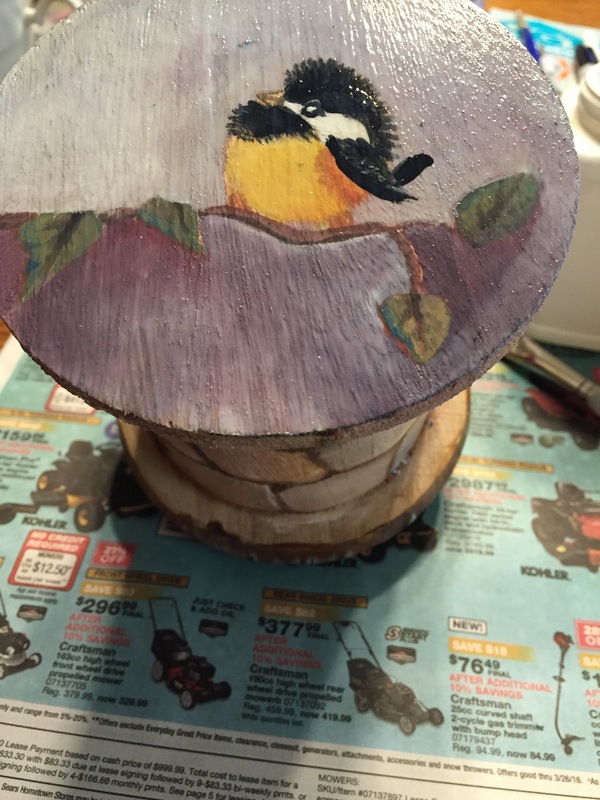 I started with white acrylic paint and then roughed in some black and brown. 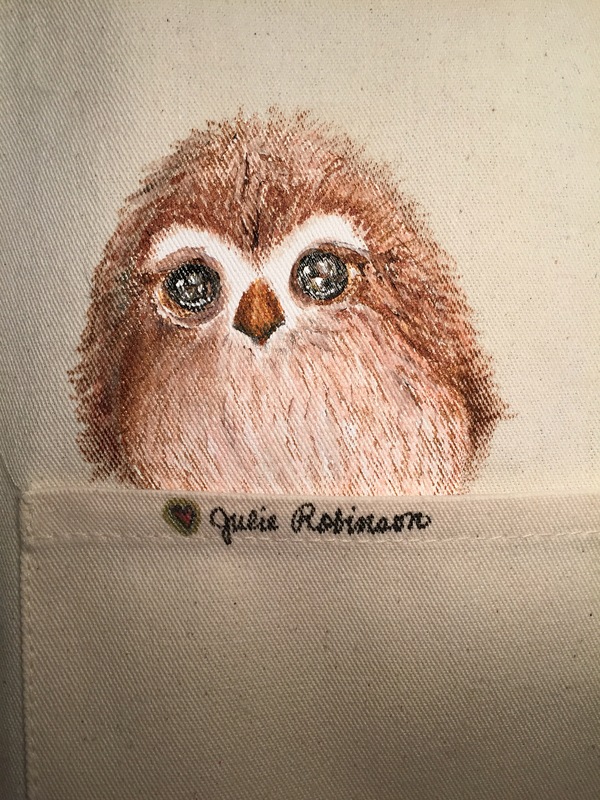 Lastly I used fabric markers and fluffed those owlet feathers and pinked him up. The shadow really made him 3D. Love that.